Cambria Washington: knitwear & patterns: Almost done! This certainly isn't my best photo ever, but it will have to do for now. We haven't found our camera's battery charger since we moved and the battery is dead...so I took advantage of the webcam and photo booth setting on the iMac. This is my completed Noro Silk Garden Sock pullover. I went back and removed the original collar, and reknit it with natural instead of the color because I didn't care as much if the natural matched exactly, and I knew that I wasn't going to be able to match up the cuffs exactly with the other colorway. This step actually opened up the neckline a little bit for me and it's a more flattering fit. I used just under two skeins of the natural (although I think I'll need to go into the third when I steek this and knit button bands), and 1.5 skeins of the rainbow. I went for 3/4 sleeves, and 3 inch ribbing on the bottom. From the armholes to the ribbing measures about 18 inches, and I knit the sleeves for 9 inches from the point where I picked them back up to knit. I found the most perfect red buttons for this sweater. They bring out the red stripe perfectly. After I finish my papers, I'll start working on the crocheted steek (courtesy of Eunny Jang's tutorial) and I'll make button bands. 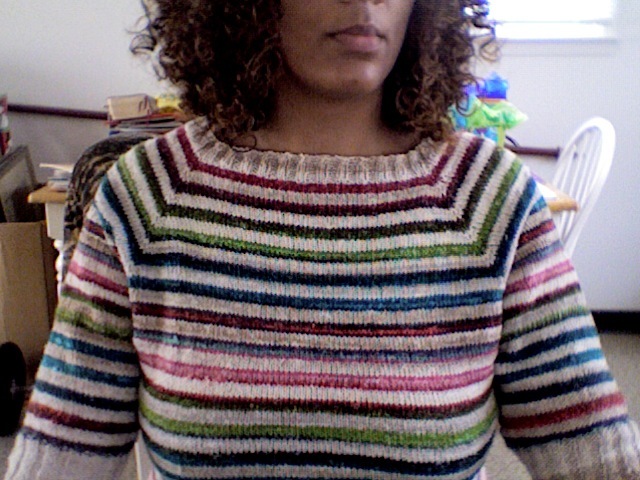 I like the sweater (and I'm wearing it right now) but I know I'll get more use out of it if I can wear it as a cardigan. I love this sweater so far, and I'm looking forward to finishing it and wearing it all through the summer and fall. And, as an added bonus, I have an idea for what to do with the two extra skeins from this project, which is inspired by my outfit disaster from yesterday. I have a really cute skirt that can be worn as a summer dress with a tube top, but I can't wear it without some type of little cardigan or shrug to cover the bra straps. The only one I have looks like its too small and the whole outfit looks bad. I thought a cute little stripped Noro shrug might just be the answer I've been looking for. So, once I finish the projects and get this steeked, I'll cast on for that shrug and see how it comes out.